This is a chronological review of our emerging knowledge about sleep/wake disorders associated with traumatic brain injury (TBI). The association of sleep/wake problems and TBI has been noted since the days of Hippocrates and Galen. During and after the First World War, there ensued a flurry of published reports concerning TBI and sleep disorders. As physicians and scientists learned about narcolepsy and cataplexy, there was an interest in “posttraumatic narcolepsy.” Then, as the new field of sleep medicine developed with electroencephalography and polysomnography, attention began to be directed to multiple types of sleep/wake disorders, which were either a consequence of TBI or a cause of it because of preexisting sleepiness. We now know that half of all TBI patients suffer from sleep/wake problems, which include insomnia, circadian rhythm disorders, obstructive sleep apnea, posttraumatic hypersomnia, narcolepsy, and recurrent hypersomnia. Some of these (e.g., sleep apnea) may be associated with neurocognitive defects more than what is seen with TBI alone. 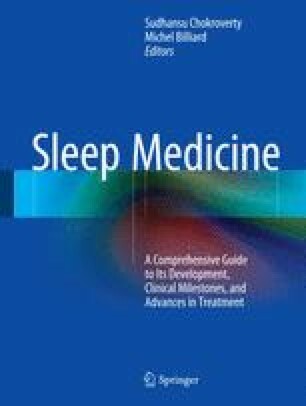 Modern objective diagnostic techniques (polysomnography, multiple sleep latency tests, actigraphy, etc.) are necessary to make a correct diagnosis, since there is poor correlation between objective and subjective methodologies in this patient population. Approximately 25 % of TBI patients have objectively defined excessive daytime sleepiness due to obstructive sleep apnea, posttraumatic hypersomnia, or narcolepsy. Insomnia is a common problem, especially in mild TBI, and some of these may be due to TBI-associated circadian rhythm disorders. DoD Worldwide Numbers for TBI | DVBIC. Available from: http://www.dvbic.org/dod-worldwide-numbers-tbi.